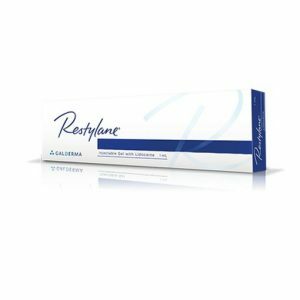 What is Restylane Lyft Perlane 1ml with Lidocaine? Restylane Lyft with Lidocaine is a sterile, transparent gel of stabilized hyaluronic acid of non-animal origin with the addition of 0.3% lidocaine hydrochloride. Restylane Lyft with Lidocaine is supplied in a glass syringe with a luer-lock fitting. Restylane Lyft with Lidocaine is intended to be used for facial augmentation. It is recommended to be used for shaping the contours of the face, the correction of folds and for lip enhancement. It should be injected into the deep layer of the dermis and/or the surface layer of the subcutis. The addition of lidocaine provides a pain relieving effect during treatment. For facial areas with limited soft tissue support and soft tissue cover, e.g. the periorbital region, injection into the subcutaneous fatty tissue or supraperiostal administration are recommended. Restylane Lyft with Lidocaine will in time undergo isovolemic degradation, which means that the product maintains its volume even during degradation. Restylane Lyft with Lidocaine is only intended to be administered by authorized personnel in accordance with local legislation. Restylane Lyft 1ml With Lidocaine is also known as Restylane Perlane 1ml With Lidocaine. Restylane Lyft with Lidocaine is an injectable dermal filler for anti-aging cosmetic treatments. This clear gel is highly cross-linked to resist being broken down within your patient’s skin and lasts longer than non-cross-linked dermal fillers. Restylane Lyft with Lidocaine has an added ingredient that other Restylane products do not have: 0.3% lidocaine to act as an anesthetic to reduce pain and discomfort for your patients as they get their injections. Restylane Lyft with Lidocaine is a thicker formula than other Restylane dermal fillers, so it is the right choice for correcting deep wrinkles and creases and severe facial lines.